The bad economy and anger with government will frame Tuesday’s election. Local measures tend to be dominated by local factors, but any proposal that raises taxes, increases costs or negatively affect jobs, faces a more difficult environment. That is especially true for the statewide initiative. Both sides of the statewide tax increase contest have had little money for the campaign. The general assumption is a tax increase in this economy will lose. Senator Rollie Heath, Boulder’s most recognizable liberal leader, is attempting to grow state revenue in an era dominated by talk of cutting government. The larger the loss, the less likely there will be an effort to address Colorado’s well-documented structural deficit. Governor Hickenlooper and much of the establishment have neither endorsed Proposition 103 nor opposed it. But, the economy is likely to sink it, along with a low turnout of mostly more anti-government voters. The municipal takeover of Xcel Boulder power system is unprecedented in a major city, especially solely for the environmental value of alternative energy. It represents a significant assumption of debt for the city with risk of increased rates. The result is being watched around the country. Aurora finally has a real mayor’s election. After decades of dominance by the Tauer family (Paul and Ed), the 2011 mayor’s race has all the elements of a top level Colorado election – a lot of money, negative ads and it appears close. Ryan Frazier, councilman and recent congressional candidate, has the advantage, but Steve Hogan claims to have closed the gap. Even in liberal Denver, Initiative 300, guaranteeing sick days for employees, has run up against concern for the cost to small businesses and the negative affect it could have in attracting new jobs. The Mayor and Governor oppose it; the Denver City Council is divided. President Barack Obama outspent John McCain in 2008 and plans to smother the Republicans in 2012 again with money. His campaign set a goal of $1 billion in 2012, and in spite of his low approval rating and the bad economy, he continues to be a prodigious fundraiser for himself and the DNC. He reported $70 million raised in the second quarter of the year and more than $50 million over the summer. And, they claim a part of the money came in online and mail-in gifts from more than a half a million donors giving them $250 or less. But upwards of half come from the well reported, high-profile events that get people’s attention with $5,000 for a seat, $10,000 for a picture and $30,000 plus for some face time. Obama benefits from a very disciplined fundraising effort, his incumbency and the lack of competition for funds from political rivals. Media reported Obama held 127 events through August of the President’s first term compared to 88 for G.W. Bush during the same period and 76 for Bill Clinton. Can money make up for the loss of voter approval and enthusiasm? If the race is close, Obama believes the answer is yes. Colorado Republicans joined the general shift forward in the presidential nomination process. Candidates and the media will be in Iowa and New Hampshire for News Years as the Iowa caucus is now January 3 and New Hampshire’s primary January 10. Colorado Republicans set February 7 as caucus night, and Nevada just agreed to February 4 after flirting with upsetting the entire schedule by moving to January 14. Colorado Democrats have left their caucus on March 6, the original Super Tuesday, which still has 13 states, including Georgia, Massachusetts, Texas and Virginia among them. Barry Noreen, the premiere columnist for the Colorado Springs Gazette, makes the point that as Gov. John Hickenlooper approaches the first anniversary of his election in November 2010, he would be unbeatable if he was on this year’s ballot. Hickenlooper has not been as dramatic as New Jersey’s Gov. Christie in his first year, or even as ambitious as Gov. Owens back in 1999, but Hickenlooper has focused on the number one issue – jobs – and had some successes. He’s also maintained an independent and moderate political image, which is a valuable commodity in Colorado. President Barack Obama is depending on the youth vote to save his presidency. They formed a major component of his 2008 landslide victory, but now are needed to fill in for major defections among White and independent voters. In the policy arena, the administration just announced in Colorado a college loan debt forgiveness program. And, the campaign just launched its youth vote effort with high-profile and expensive initiatives, including a new website using Facebook, Twitter and social media. Expect to see a lot of activity on college campuses. And remember, there are millions of new young people today who were 14 to 17 years old in 2008. They are now in college or looking for work. Democrats want them next November. In 2008, voters aged 18 to 29 were 14 percent of the Colorado electorate, but dropped down to 9 percent in the Democratic local “shellacking” in 2010. 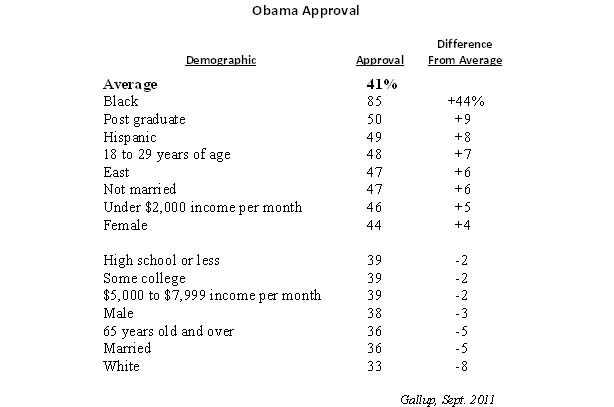 Obama won the national youth vote by 66 percent in 2008, but today, he has only a 48 percent approval rating among them. Obama’s second visit to Colorado and it’s all about the base. Last visit, a Hispanic high school and now an urban college campus – base, base, base. The record amount of money contributed to Denver’s three school board elections demonstrates that although the race may lack heat, the stakes are high. The board majority could shift from reform to the pro-union faction if the two district seats elect the anti-reform candidates. The union contributions make clear which candidates they believe will be in their camp. In general, candidates have avoided high-profile fights and name-calling this year. But, the pro-union candidates tend to resist any changes that reduce union membership (i.e., charter schools) or constrain the application of negotiated contracts. The non-union pro-reform candidates dominate the contributions collecting 75 percent of the total, or $515,000, by early October. Major contributors are business and foundation leaders, including Bruce Benson giving $30,000 and Dan Ritchie with $78,000. 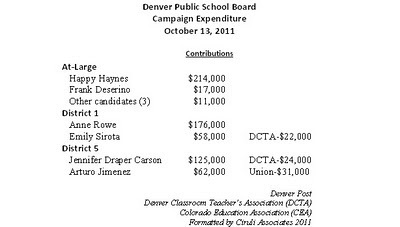 The local teachers union contributed about $50,000 directly to their two candidates. The total reported DCTA contribution as of October 18 was $88,000 of which $42,000 went to new committee for campaign fliers and mailers. 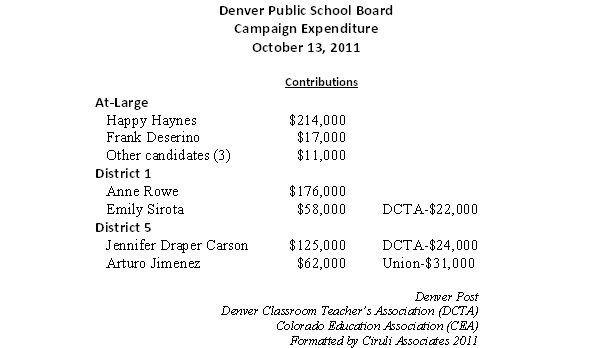 Additionally, indirect contributions of $92,000 were reported by the statewide Colorado Education Association. These funds were not reported for specific races in Denver or other school districts. America’s preference for candidates has been studied for decades, but it’s always enlightening to describe the positions of the major independent variables of the body politic as they divide in a presidential election. President Barack Obama wanted to be a unifier and above the political fray, but after 3 years, he’s as embattled as any president in modern history and the object of intense and polarized feelings among the public. At a 41 percent monthly average approval in September – one of the lowest in his administration – Gallup reports Obama is above President Carter (32%) a year before his loss, but below President Clinton (46%) before his win in 1995. Obama benefits from approval levels that are higher than his disapproval levels, averaging 7 percent above the average of 41 percent among allies and 4 percent below the average among skeptics. 2012 Election Options – 1980 Blowout or 2000 Close? As the prospects for the re-election of President Obama have narrowed, only two scenarios are seriously discussed – a Republican blowout like 1994, or 2010 on the congressional level, where a united Republican Party was joined by the vast middle of the electorate, which swung away the Democrats; or a narrow national win, where a single state election may decide the winner, like 2000 (Bush vs. Gore). One of the best signs a landslide is possible is the generic ballot test that shows Obama losing to an unnamed Republican nominee. A large majority of voters are voting either for or against the incumbent, and those against are significantly larger, mostly because of the shifting of the middle. This type of election would be like the end of President Carter’s re-election effort in 1980 when voters took a chance on Ronald Reagan, giving him a big final win after an election season of close polls. In this case, Colorado’s electoral votes simply join the Republican majority. The other scenario is a narrow or even one state victory, like 2000. The ultimate irony could be the Republican nominee wins the popular vote and Obama wins the electoral college – reversing the controversy and felt injustice among the Democrats in the Gore vs. Bush finale. If this election gets down to one state, Colorado will likely be among the final battlegrounds and has many conditions and recent historical precedents that make it the best candidate for the final battle. Recent elections have swung between the parties and been reasonably close. G.W. Bush won the state in 2000 by 8 points, 5 points in 2004, and then Colorado swung to Obama by 9 points in 2008. In between presidential elections, Democrats swept the congressional races in 2006, but the tide reversed in 2010 and they were swept out. The 2010 U.S. Senate battle between Democrat Michael Bennet and Republican Ken Buck turned out to be the closest in the country, with Bennet the final winner by only 40,000 votes, or 2 percentage points. Colorado is consistently at or near the middle of the states in ideology and partisanship. The closely balanced party identifiers are nearly matched by unaffiliated voters. The independent voters are formed by unaffiliated voters and a large bloc of weak party identifiers. The entire group are volatile voters, swinging between the candidates, depending on events and targeted appeals. And, they are late deciders, which under this election scenario means the two candidates and their respective parties will toss every general and targeted appeal into the mix through to Election Day. Colorado polls in elections since 2004 have tended to mirror the national trend; hence, if it’s close nationally, it will likely be even closer in Colorado. And current polls show it’s close. Steve Hogan started his campaign for Aurora mayor more than a year ago and gathered significant endorsements from the Aurora municipal power structures and development interests. But, Ryan Frazier has had his strength in name identification from long service on the Aurora City Council and his unsuccessful 2010 congressional race. In the two of three most important metrics available in the race, Frazier has dominated. A poll circulated in August showed him ahead and the latest fundraising numbers put his October contributions at nearly two-to-one over Hogan. Hogan has been aggressively on the negative the entire month of September with criticism of Frazier, which culminated in a TV commercial attacking Frazier for absenteeism, votes on employees’ bonuses and “sending jobs overseas.” Clearly, Hogan believed he was behind and intended on winning with a negative campaign. Hogan claims to have closed the gap and is now in a tie at 20 points each with Frazier (34% undecided). After years of the Tauer family dominating Aurora politics, the city is reverting to the campaign style of Denver, but with a lot less money. President Barack Obama is beginning to spend as much time on the campaign trail as in Washington, a reflection of the trouble Obama is in with voters and the unlikelihood anything worthwhile will be accomplished in D.C.
Colorado is one of his most frequent stops due to its prominence as a leading state that could swing between either party’s nominees. Although Democrats begin the race with a considerable electoral advantage of 242 in states that have voted Democratic in 5 out of the last 5 elections versus Republicans who can only count 102 electoral votes in that category, it’s the last 28 electoral votes, or slightly more than 10 percent of the total, needed that challenge the Democrats. Ohio, Nevada, Colorado, Florida, Virginia and North Carolina are at the top of Democrats’ list. In examining the targeted states, Colorado’s advantage became apparent. It has 9 electoral votes, almost a third of the final total needed, Obama won it by 9 points in 2008 and it’s gone Democratic in two of five last presidential races – Obama in 2008 and Bill Clinton in 1992. Although Virginia and North Carolina have more electoral votes, the wins were closer, they only have gone Democratic in one of the last five presidential elections. Nevada will be a target, but its electoral vote count is tiny, and Ohio, which should be in the Obama column, has been trending and polling away from Democrat. Although it appears the National Western Stock Show got its proposal to move to Aurora well ahead of any thorough planning, the options, costs and benefits are finally coming into view. Remain in place with little or no expansion. This is what the Stock Show has been doing and it clearly is not viable. Move to Aurora. This option was never really politically possible, but is now off the table due to the poor initial introduction of the concept. Even an annexation into Denver as part of the Gaylord Development is likely to meet major resistance and receive no financial support. Expand on the current location. This may be the best option in terms of city support, but there are land use issues to resolve. Move to a new location in Denver. A new location will likely receive local support, but it will need to be a part of an economic development and land use strategy that enhances the Stock Show’s contribution to the economy. The two expansion options, either on its current site or at a new site, will require some type of public financing. Construction bonds financed by the sales tax used for the football stadium or a property tax increase will need to be a part of the mix. Also, the Stock Show may need some type of public financing to maintain operations and perform maintenance. Unfortunately, they don’t operate with a business plan and don’t have one related to the expansion options. Hence, it is difficult to say what long-term financing is needed. But, if public money is involved, there will be a need for a major infusion of public process and participation into the current governance. 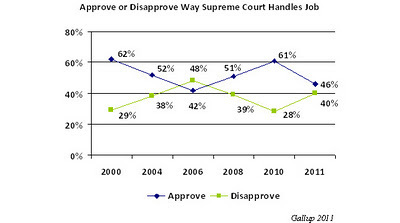 Decisions the U.S. Supreme Court makes this year will dramatically affect public policy, could help decide the presidential election and will likely alter the Court’s reputation with the American people. 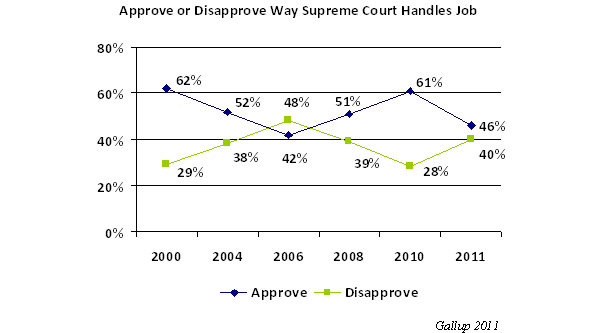 As the Court begins its 2011-2012 term, public approval of the Court has dropped 15 points since a recent high of 61 percent (2009). Support among Democrats has dropped 29 percent during the same period, no doubt due to President Obama’s high-profile criticism of the Court’s decision on campaign finance. Part of the Court’s decline in approval reflects the near across the board drop in approval and trust in major institutions, especially those associated with the national government. Although a plurality (42%) of the public believes the Court is about right in its ideological leanings, more of the remaining voters believe its leans left (31%) than leans right (20%). The Court’s looming health care mandate decision could affect the 2012 presidential election and will clearly constrain or relax the perceived boundaries of federal legislation. One party of the two parties is likely to be very unhappy with the decision. The Court also may review controversial lower court cases over state authority related to illegal immigrants and college-level affirmative action. The Denver Public School Board election has taken on a stealth quality. The anti-reform, pro-union faction believes it’s in their interest to reduce the controversy and align themselves with the charter and new schools’ models, even if it irritates their union supporters. Hence, forums are quiet, and the black and white contrast toward reform is now colored gray with slogans about helping the kids and opposing the bureaucracy. The majority faction, with three candidates in the field, also believes calm will allow them to move voters with well-financed appeals to not change the pro-charter reform direction. The two district races could be close given the low-key quality to the election. Both ednewscolorado.org and Vincent Carroll in the Denver Post have illuminated the opaque quality of the race. Colorado’s nine electoral votes have become critical to President Barack Obama’s re-election chances. To shore up his declining support, Obama will be back a second time in less than month. Obama has 242 electoral votes if he can hold all the states Democrats have won in five out of five of the last presidential elections. It’s the final 28 electoral votes that are the challenge. President Obama’s fall offensive and jobs program was a survival tactic. The latest dip in the economy has focused the national political conversation laser – like on jobs and Obama’s solution. The latest bad news of the slowing GDP and continuing unemployment broke what was an economic narrative of recovery. To the extent European troubles contribute, just adds a new anxiety that globalization is more of a threat than a boom. August and September polls tell the story of how the economy forced the administration to a high energy, high-profile campaign, using a new stimulus package to try to shift the conversation to Obama’s plan and blame to the Republicans. The following are September polling headlines. This malaise even affects the heartland of the Democratic Party – California. Ninety-one percent of voters say the economy is in “bad shape” and 72 percent believe it will be “worse” or “same” next year. 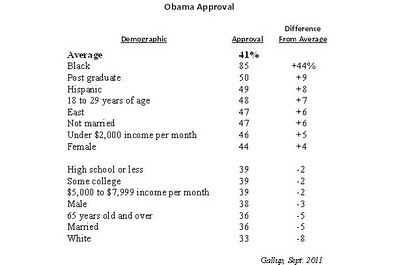 Obama’s approval rating dropped to the mid-40 percent range in California in September. Obama suffers not only from the facts of the economy, but the apparent failure of his previous remedies and his lackluster performance in the debt ceiling crisis. The reconfiguration of the Obama re-election campaign into a fighting machine for jobs was essential, but faces a mighty challenge with only one year left. Obama has finally inherited from a majority of voters blame for the economy and from most of the public skepticism that Washington has a solution.